The Corporate File is used to set up special rates or discounts for companies or other entities. This allows you to select a Company when making a reservation or checking in a guest. A prompt will ask, "Update room rate with company rate?". Even if you answer No to the prompt the guest will still be associated with the company. You can print a report showing the company name and address, comments about this company, total room nights, total revenue, average rate, last stay date, and special rate. Go to Manager/Setup > Hotel Control Files Setup > Corporate File. 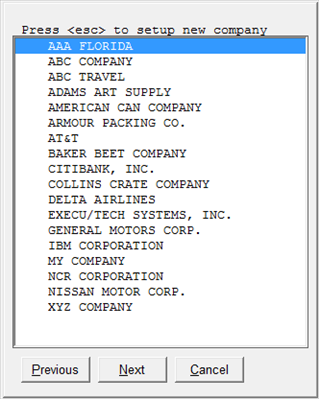 A prompt will display, "Enter all or part of company name". At the prompt enter the first letter of the company name to display all companies beginning with that letter. We suggest entering no more than one letter in case the company has been inadvertently entered under more than one spelling (such as AAA, A A A, A.A.A. etc.) or in case there is more than one company with a similar name. If you wish to view all companies, simply click OK or press Enter at the prompt. If you do not see the company name displayed, then press Esc on your keyboard to go to the Setup Screen. 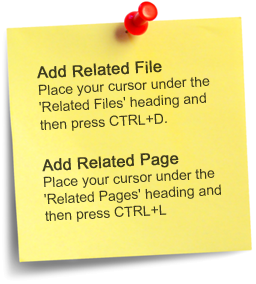 To view or change a record, click the company you wish to view, or use your keyboard down-arrow then press Enter. This will open the record for that company. "This company? (Y)es, (N)o, (C)hange information" will display if you open an existing record. It will not display if you are setting up a new company. 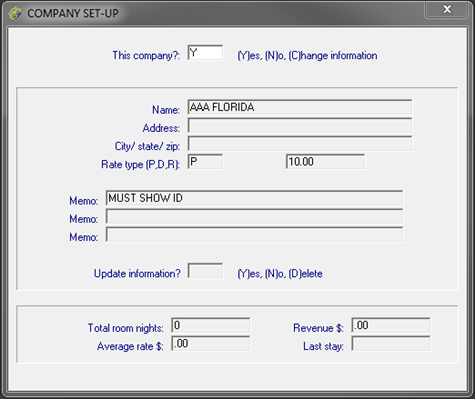 To change information type C. This window also will display when a company is selected in a reservation or folio, allowing you to answer Y to select this company to apply to the guest or N not to apply this company to the guest. "Name" may be up to 30 characters. This is what will display at look-up. This also is what the system will verify if the Parameter Record is set to verify the guest's company name. Each character, including punctuation and spaces, matters. AAA is not the same as A.A.A. or A A A or aaa. Take care not to inadvertently duplicate a company by entering the name differently than an existing company that you mean to select. Users also should take caution when making a reservation or checking in a guest. "Address" my be up to 30 characters. "City/ state/ zip" may be up to 30 characters including spaces and punctuation. "Rate type (P,D,R)" may be P to discount the room rate by a percentage; D to discount the room rate by a dollar amount; or R to specify a room rate. To the right of this field enter the amount. Percentage should be in this format: 10.00 for ten percent. Dollar discount should be in this format: 20.00 for twenty dollar discount. Rate should be in this format: 80.00 for an eighty-dollar rate per night. The percentage and dollar discount options will discount the room rate based on the defaults for the room rate selected. The Rate option will overwrite the default rate for this room when this company is applied to the guest. "Memo" may be any information you wish to enter such as "Must show ID" or "Executives only". Each of the three lines will allow up to 40 characters. "Update information" - Y to save or update the information; N to exit without saving; D to delete the record. The information about this company, "Total room nights", "Average Rate $", Revenue $", and "Last stay" is populated by the system and cannot be changed. The following prompt is part of the Parameter Record . If this is set to Yes, then the system will look for the company name EXACTLY as it has been typed by the user when making a reservation or checking in a guest. If it does not find the company a popup will state that the company does not exist and will ask if you want to set it up. If you are using this option, you should always LOOK UP the company rather than typing it so that you do not inadvertently duplicate an existing company by spelling it differently.